Eugène Ysaÿe was a Belgian violinist, composer, conductor, and teacher born on July 16, 1858 (Brahms was 25 years old.) His first lessons were with his father but later on, he was largely self-taught until about age 12. After he entered the Conservatory at Liege at age 7, he was dismissed because he made little progress. As a teenager, he became a pupil of both Henryk Wieniawski and Henri Vieuxtemps. Having graduated from the same conservatory he had previously been kicked out of, he became concertmaster of a highly accomplished orchestra which was about to become (in 1882) the Berlin Philharmonic – Benjamin Bilse’s Band. Many famous musicians frequented the beer hall where this orchestra played – among them were Joseph Joachim, Franz Lizst, Clara Schumann, and Anton Rubinstein. At age 27, Ysaye made his Paris debut and thus began a highly successful concert career. The following year, he was appointed violin professor at the Conservatory in Brussels, Belgium. Louis Persinger, Josef Gingold, Nathan Milstein, Jascha Brodsky, Nikolai Sokoloff, and William Primrose were among his many students. In 1886, he founded the Ysaye String Quartet. Debussy, Saint Saenz, Chausson, and Franck were among composers who dedicated works to him. Ysaye was a busy concert artist. In fact, he turned down the conductor’s post at the New York Philharmonic when it was offered to him (1898) precisely because he was too busy. Understandably, Ysaye did not have too much time to compose though he wrote six sonatas for solo violin which are part of the standard repertoire, some chamber music, a few orchestral pieces, and an opera (Peter the Miner.) 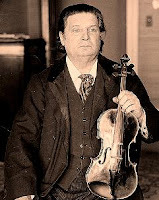 Carl Flesch, the Hungarian violin pedagogue was quoted as saying that Ysaye was the most outstanding and individual violinist that he had ever heard in his life. Ysaye was principal conductor of the Cincinnati Symphony for four years – 1918 to 1922 – and made a few recordings with that orchestra. It was during his tenure there that he met his second wife – he was 66 and she was 22 (Jeanette Dincin, a violinist.) Ysaye died in Brussels on May 12, 1931, at age 72.